Samsung has launched two new tablets in the Galaxy series with the names Galaxy Tab S4 and Galaxy Tab A (2018) today. Both the new tablets feature a 7300mAh battery. The Galaxy Tab S4 is powered by the Snapdragon 835 while the Galaxy Tab A 2018 comes powered by a Snapdragon 450 processor. The Samsung Galaxy Tab S4 is priced at $649.99 for the 64GB inbuilt storage option and $749.99 for the 256GB inbuilt storage WiFi variant. In the US, it will be available from August 10, 2018, via Amazon, Best Buy, and Samsung.com whereas the LTE version will be available from Verizon first, AT&T, Sprint and US Cellular later in Q3 2018. 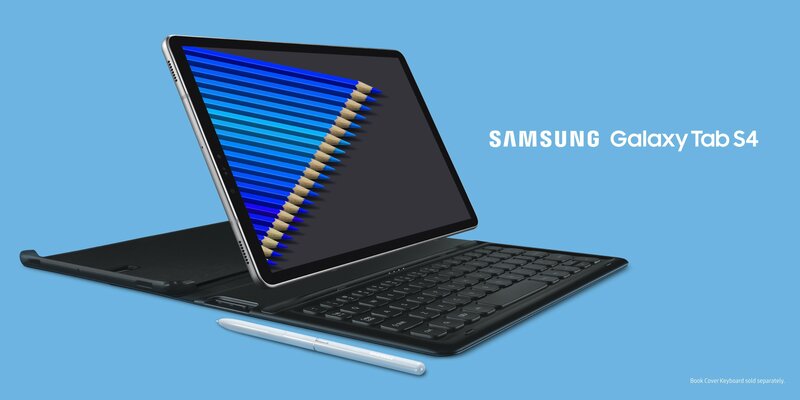 Pre-orders for the tablet will start from today through August 9, 2018, on Samsung.com and the users pre-ordering the tablet will get a free Book Cover Keyboard worth $149.99 till September 8, 2018. The Samsung Galaxy Tab A (2018) 10.5 is priced at €329 (around $383) for the Wi-Fi variant and €389 (around $453 for the LTE variant. It will be available for sale from August 24th. 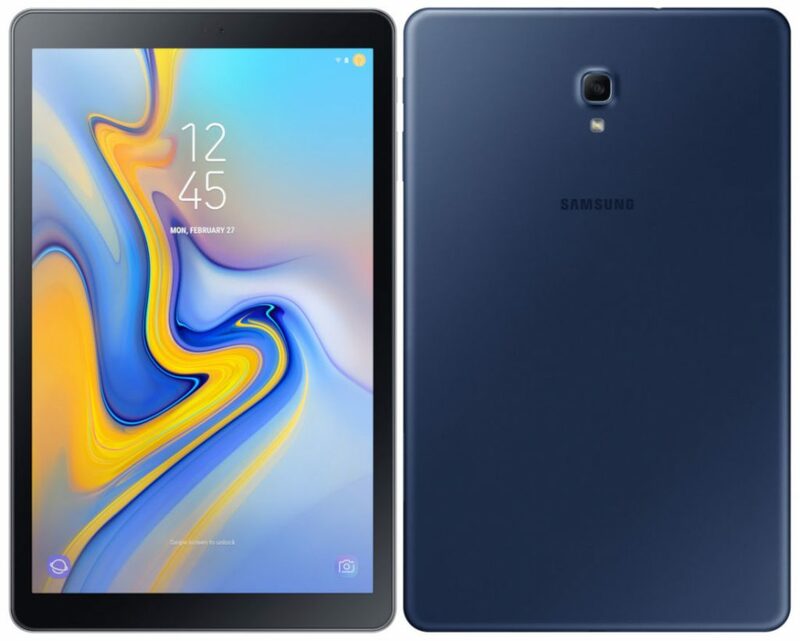 The Samsung Galaxy Tab S4 features a 10.5-inch WQXGA 16:10 aspect ratio Super AMOLED display with 2560×1600 pixel resolution and is powered by the Octa-Core Snapdragon 835 Mobile Platform with Adreno 540 GPU. It has 4GB of RAM with 64GB / 256GB internal storage options which are further expandable up to 400GB with microSD card slot. It runs on the Android 8.1 (Oreo) out of the box. It has a 13-megapixel rear camera with LED flash and a 5-megapixel front-facing camera. It has a 7300mAh battery available with fast charging and also comes with Iris Scanner. It comes with 4G LTE (optional), WiFi 802.11 ac (2.4GHz/5GHz) MIMO, Wi-Fi Direct, Bluetooth 5, GPS, GLONASS, USB 3.1 Type-C, POGO pin, 4 speakers tuned by AKG and Dolby Atmos. It measures 249.3 x 164.3 x 7.1mm and weights 482 grams for Wi-Fi variant and 483 grams for the LTE variant. The Galaxy Tab A (2018) features a 10.5-inch WUXGA 16:10 aspect ratio TFT LCD display with 1920×1200 pixels resolution. It is powered by a 1.8GHz Octa-Core Snapdragon 450 14nm Mobile Platform with Adreno 506 GPU and comes with 3GB of RAM and 32GB internal storage capacity with expandable storage up to 400GB with microSD card slot. It runs on the Android 8.1 (Oreo) OS out of the box as well. It features an 8-megapixel rear camera with LED flash along with a 5-megapixel front-facing camera. It has a 7,300mAh battery and supports 4G LTE (optional), WiFi 802.11 ac, Wi-Fi Direct, Bluetooth 4.2, GPS, GLONASS, USB 2.0 (Type C), 4 speakers and Dolby Atmos features. It measures 260.0 x 161.1 x 8.0mm and weights 529 grams for(Wi-Fi variant and 534 grams for the LTE variant.